JUBILANT: Winners of the 155th Brilliant Trophy Open Chess Tournament held at Brilliant Grammar High School. 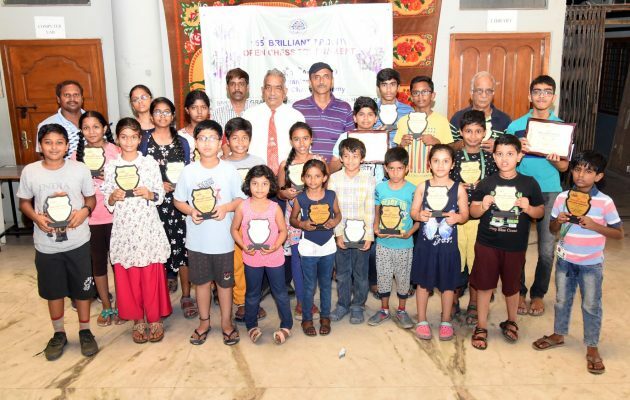 Hyderabad: Sibi Srinivas from Takshasila Public School, Tarnaka and Ch Anirudh from DPS, Nacharam bagged the junior and open category titles in the 155th Brilliant Trophy Open Chess Tournament held at Brilliant Grammar High School, Dilsukhnagar on Sunday. Anirudh won the event by scoring 5.5 points out of 6 rounds, while Sridhanvi and Sriniketh secured the second and third places with 5 points apiece. In the open category, Srinivas and S Khan were initially tied for first place with 5.5 points and the winner was decided in the tie-break. Shanmukha got third place with 5 points. Open category top ten: 1. Sibi srinivas, 2. S Khan, 3. Shanmukha, 4. Akira, 5. Raghuram Reddy, 6. K Saratchandra, 7. M Raviteja, 8. Md Basiq Imrose, 9. Aravind PVS, 10. P Karyasheel. Winners: Boys: U-6: 1. Vihaan Saikrishna, 2. Gurudev; U-8: 1. Aansh Nandan, 2. Prajwal; U-10: 1. A Pranay, 2. Srinandan Reddy; U-12: 1. Surya Sahaas, 2. V Aarush. Girls: U-6: 1. Aishwarya, 2. Ch Keerthi; U-8: 1. Anaya Agarwal, 2. Meena; U-10: 1. Rida Anwar, 2. T Rithika; U-12: 1. Ch Srikari, 2. Sri Vyuha; U-14: 1. Induja Goud, 2. Gnana Siri; Best woman: Kheerti Ganta; Best veteran: M Rammohan Rao.